Glenn Hamilton loves what he does. That’s obvious from just listening to him talk about his 35+ years in radio… from getting his start at the local station in Kerrville, Texas, as a teenager to his current role as the co-host of the popular “Glenn Hamilton and Amy Warner” morning show on The River 97.3, as well as the many stops in between. Speaking to a classroom full of students, staff and faculty last week, Hamilton had many wise words for those seeking a career in radio, though his advice was applicable to many other fields as well. Hamilton has been a mainstay on local radio for more than two decades since joining The River in 1992 as the afternoon DJ. Much like his on-air personality, he comes across as a down-to-earth, rock’n’roll-loving dad with an impish sense of humor, which is often directed at himself. iHeartRadio, the nationwide network that owns The River, reaches more people each month (273 million) than any other media company, including Google and Facebook, according to statistics shared by Hamilton. The veteran DJ bases his optimism on not only the connection factor, but also the proliferation of radio apps and smart speakers, such as the Amazon Echo, which makes it easier for people to listen to their favorite stations at home. 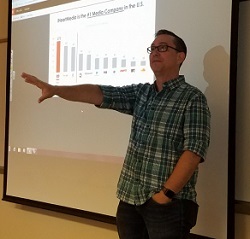 Hamilton encouraged students interested in becoming DJs to record themselves reading magazine ads and Wikipedia entries as a way to improve their intonation and inflection. He also said the best way to get involved in radio is start with a behind-the-scenes job in promotions, events or sales.